Charitable Words is pleased to introduce its newest Charitable Words Scholar. 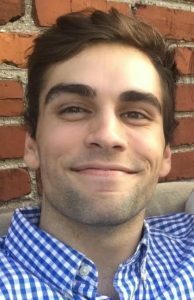 Tim Seiter is a recent graduate of the English Rhetoric and Professional Writing program at the University of Cincinnati, and double majored in International Business. He will be working with project manager Brittany York on content and website development for Journey to Hope, a Cincinnati nonprofit that strives “to be known as the regional place where people who are hurting and suffering as a result of life’s challenges go to find hope and healing,” says Diane Kinsella, Journey to Hope’s Executive Director. During college, he traveled the world to locations like Peru, Austria, Italy, Spain, Chile, and more. The knowledge he gained from these experiences made him want to improve the world around him by telling the stories of people and organizations trying to make a positive change. Tim has worked in all different types of environments: from a cancer research lab where he wrote newsletters and organized charity events to the Over-the-Rhine Chamber of Commerce in Cincinnati where he worked with small, local businesses to improve the community and wrote grant requests that helped secure a better future for the area. While he looks for a full-time position, he is proud to be working with Charitable Words to help a local non-profit tell its story and increase its accessibility to the surrounding community by building a new and improved website by applying the knowledge he gained from his college courses and previous internships. The opportunity to work with a local organization to gain experience and support himself while looking for a job in his career field is amazing, and he looks forward to the growth and knowledge this program will provide. Charitable Words’ Project Manager Brittany York and has been working with Journey to Hope since last summer as the nonprofit’s Marketing and Development Coordinator. The nonprofit currently accomplishes its mission as it serves more than 450 clients, offering a variety of support and coaching groups at little or no cost. Since Brittany began her work in June, she’s crafted and designed a revamped, quarterly print newsletter, in addition to a weekly e-newsletter — also redesigned and in-color — which has allowed the organization to expand its outreach (the e-newsletter’s open rate was previously at 18% and is now at 30%), established a social media presence, and helped bring in $2,000 in funds from the nonprofit’s first-ever crowdfunding campaign. Please sign up here if you’d like to receive Journey to Hope’s weekly newsletter. Charitable Words is a unique nonprofit social enterprise that matches students interested in purposeful (and paid) internships and assignments with causes they care about. Since 2012, Charitable Words has connected more than 30 nonprofits with 70 students and recent graduates and hundreds of hours of pro bono engagement by our network of volunteer advisors. Their impact has been evident. Yet to be measured: The lifelong impact of purposeful scholarship, internship and special assignment experiences on their personal growth, and how much they will give back to their communities over time.